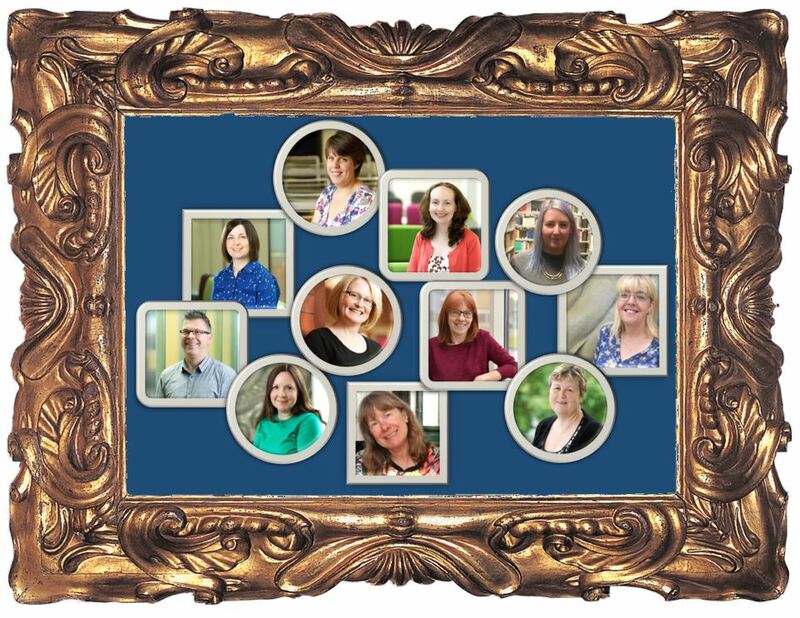 Your Librarian can help you design search strategies, access key databases for your subject area and use them effectively so you find the best information for your assignments or research, show you how to reference that information correctly, provide support for Distance Learners, and use the myriad of Library resources and facilities available to you at Salford. 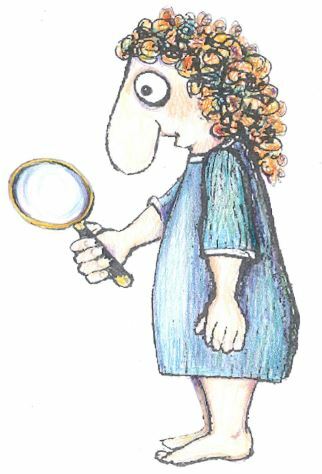 To find your Librarian go to http://bit.ly/sflsubject, or collect our business cards from the Enquiry Desk when you next visit the Library. All our open access PCs and Macs are installed with EndNote X8. 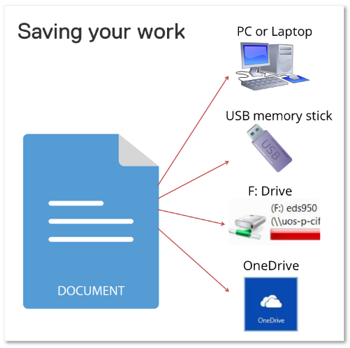 This is a package that allows you to create your own library of references and add citations and a reference list to your Word documents – automatically and correctly! There is also a free web version called EndNote Online, which you can use at home or anywhere else you have internet access. 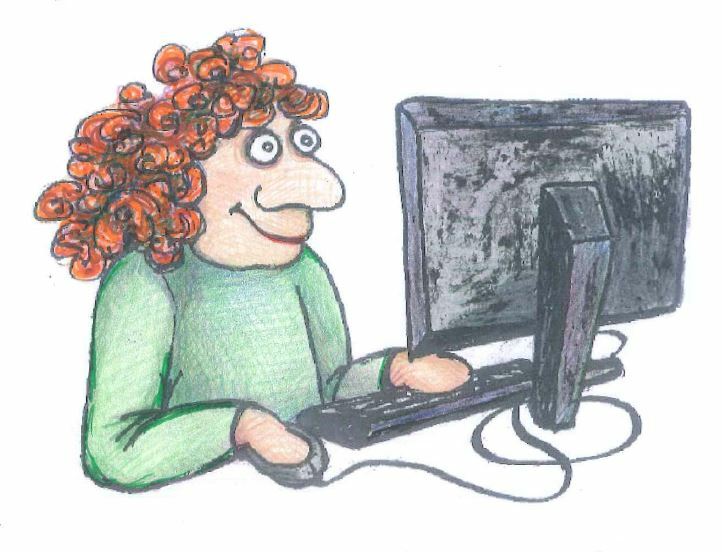 Would you like to learn how to use EndNote? We run workshops throughout the year. Click the button to find the next one and book your place. 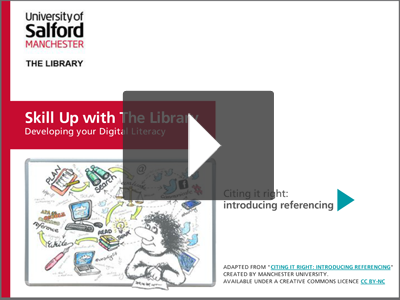 Skills for Learning has lots more information about referencing and plagiarism here. The Library provides online access to a wealth of dictionaries and encyclopaedias, and other publications such as directories and handbooks, which are known as reference works. They are usually arranged in alphabetical order and provide short, factual articles to give you a brief overview of a topic – just like Wikipedia, but from a reliable, academic source. A dictionary is a book providing definitions of words and phrases. It can be a language dictionary or a specialist subject dictionary. You can use dictionaries to help you understand the words and concepts in your essay question. 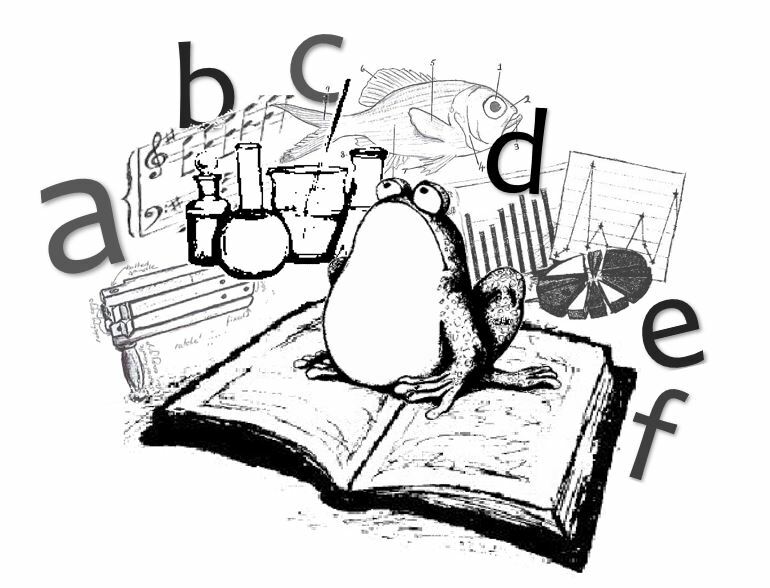 An encyclopaedia is a book, or set of books, giving information on either many branches of knowledge or a specific subject. You can use encyclopaedias to get an overview of your subject before you move on to more detailed research. Looking for patents? Anne shows you where you can find them. Patents are useful as they can show the latest technological development in a particular field, and often describe significant developments long before they are revealed elsewhere. 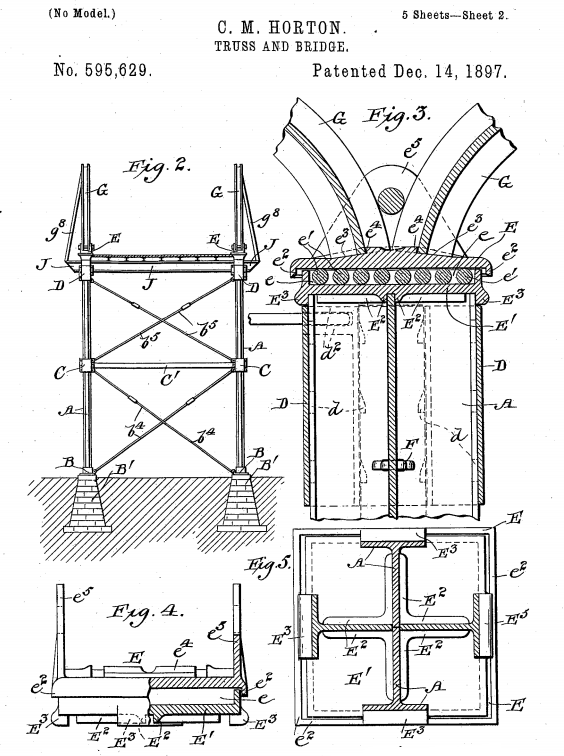 If you are working in a field of engineering, for example, and need to think of a design solution to a particular problem you might like to look at some patents for inspiration. You might be familiar with Scopus for finding journal articles, but did you know it provides access to over 28 million patents from five patent offices as well? To access Scopus go to the Library’s Resources page, click the letter ‘‘, select ‘SCOPUS’, then click ‘Link to Database’. Because the patents on Scopus are drawn from different offices, the pages you click through to will look different – but look for links called “Image” or “Original Document”, etc. I think this cat has every right to look alarmed, don’t you? Do you know how to reference a patent? Your in-text citation uses the Patent Office number and year, but not the inventor. 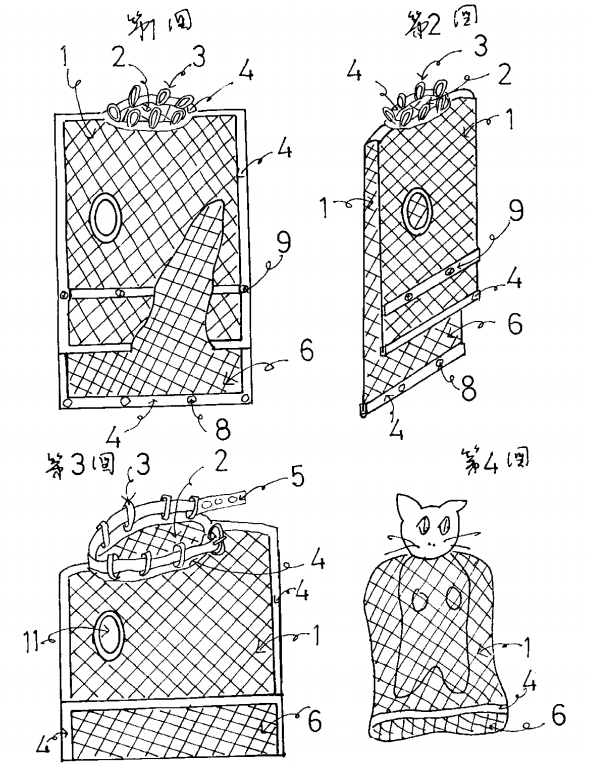 Japan Patent No. JPS59139052U (1984). What’s more, you won’t find this information on Google or Wikipedia – in in many cases the data and information is unpublished and only available through ESDU. When you are designing or building something, you don’t want it to fall apart, do you? 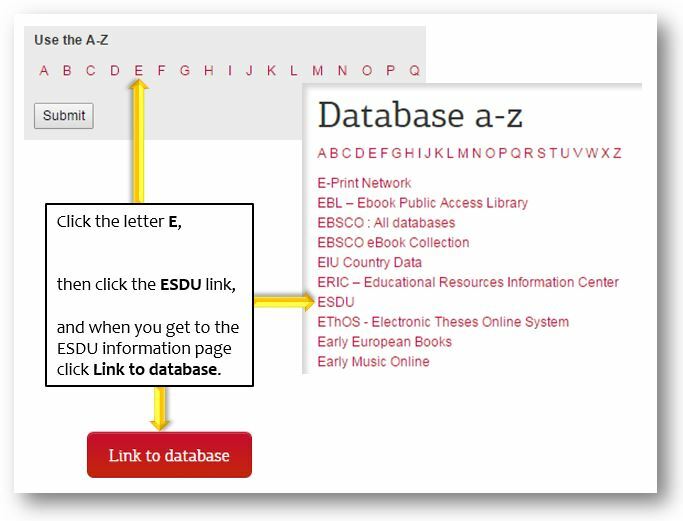 Access ESDU through Library Search. When ESDU opens read the Agreement and click the Yes, I accept… button. 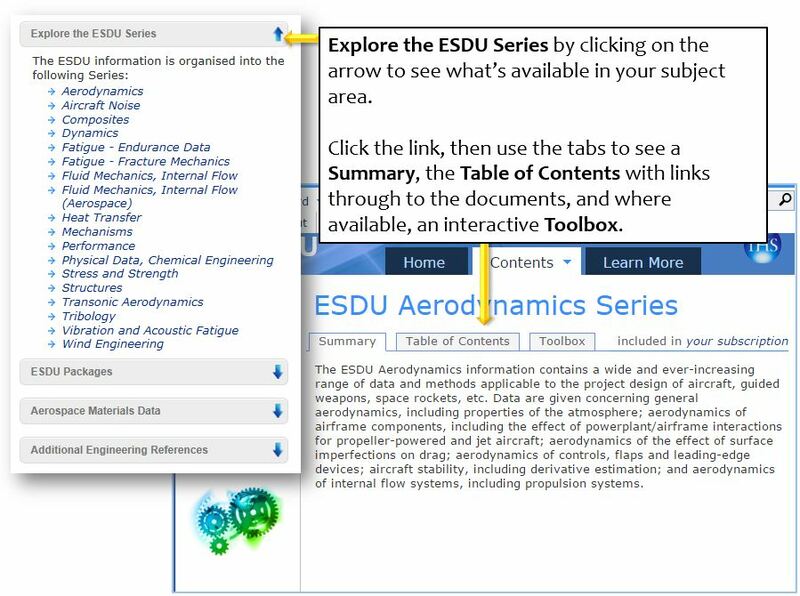 Once you are familiar with the types of information you can find on ESDU, try using the Search box to find the things you need. Want to improve your critical analysis skills? Anne shows you how. During your time at university you will often be asked to critically analyse things – in your reading and writing, in essay titles, assignment instructions and exam questions. Also, when your assignment is marked your tutor might comment that your work is “too descriptive” or that “there isn’t enough critical analysis”. 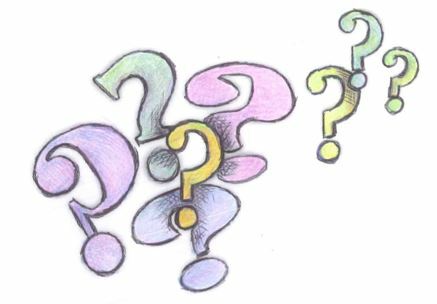 Descriptive writing is simply describing a situation or summarising what you have read. 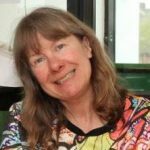 Critical analysis shows that you have examined the evidence, understood the arguments and analysed the conclusions – and can discuss these in your own writing. You need to use both. If you are discussing a book, article or report you will need to provide some description of what it is about before you can analyse it, but the critical or analytical element of your writing is more important. Because the ability to show that you can identify arguments, clearly analyse, evaluate and compare ideas, and synthesise the information to support your own arguments shows that you have learnt something. This what your tutors want to see! Unsurprisingly, the better your skills are, the better your grades will be. 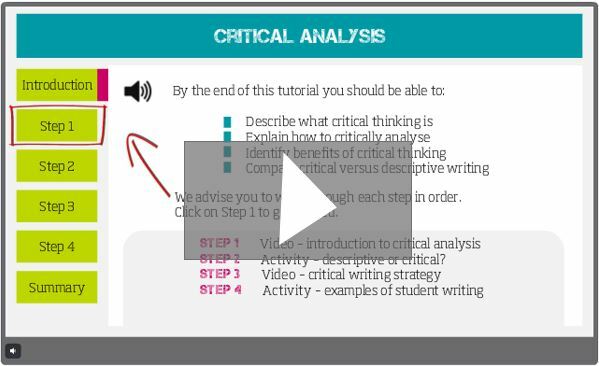 This e-Learning will introduce you to critical analysis and help you to understand the difference between descriptive and critical writing. You might also like this handy study guide Critical analysis of a journal article which takes you through the steps involved in analysing journal articles. This means if someone reading your work sees an interesting idea they can use the citation to find the matching reference, and then use the details in the reference to find the original work to read for themselves. Yes, usually it is. But sometimes a citation might match two references, for example, an author might have written two papers in the same year and you have used both of them in your essay, or you might have two different authors with the same surname writing in the same year. These are called Ambiguous Citations, and when this happens you need to add extra information to your citations to differentiate them. 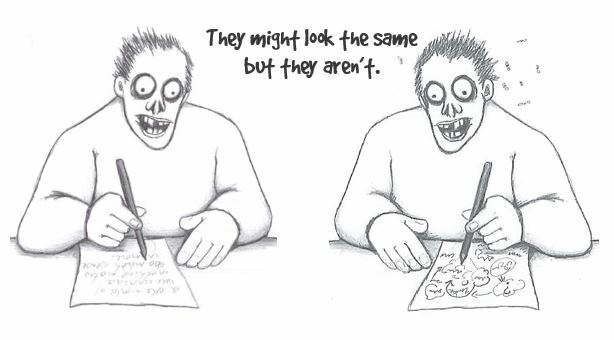 The same author has written two or more works in the same year. If you are citing these two works together, treat them like this (Davis, 1983a, 1983b). Here’s the tricky part! Assign the letters a, b, etc. in the order the works will appear in your reference list – which is not necessarily the same order they will appear in your writing. Davis, E. W. (1983a). Preparation of the Haitian zombi poison. Botanical Museum Leaflets, Harvard University, 29(2), 139-149. Sometimes you might cite two or more works by different authors who have the same surname. If they have been written in different years this isn’t a problem, your reader will be able tell the apart. But what if they have been written in the same year? Parker, F. (2011). What would Foucault Think about Speed Runs, Jeep Jumps, and Zombie? In L. Cuddy (Ed. ), Halo and Philosophy: Intellect Evolved (pp. 161-175). Chicago: Open Court. Parker, J. (2011). 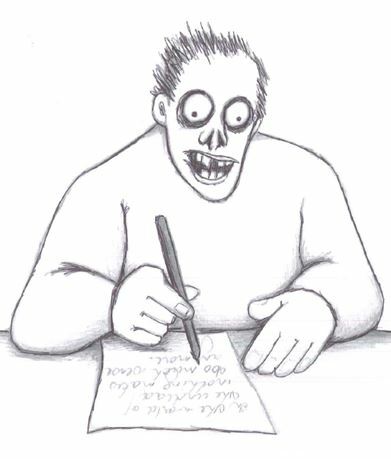 Our zombies, ourselves: why we can’t get the undead off our brains. Atlantic Monthly, 307(3), 32-33. (James Parker, 2011) and (John Parker, 2011). Okay, this is getting complicated now. Bear with me. Quite often you will get research teams working together and writing papers together, and sometimes they will write several papers in a year. If you are familiar with the APA 6th style of referencing used here at Salford you will already know that when you have a work with three to five authors you list all their names the first time you cite the work, and in subsequent citations, just the first author followed by et al. – which is an abbreviation for “and others”. So if you have a work written by five people list all their names the first time you cite it, like this (Maxwell, Scourfield, Holland, Featherstone, & Lee, 2012) and then when you cite it again you only need to name the first author followed by et al., like this (Maxwell et al., 2012). But what if Maxwell and her research team wrote more than one paper in 2012? Here’s the other one: (Maxwell, Scourfield, Featherstone, Holland, & Tolman, 2012). In a case like this you can’t use (Maxwell et al., 2012) for subsequent citations, because you won’t be able to tell which work is which in the reference list. To differentiate them you need to add more authors until the citations are unique. In this example the first two authors are the same so you will have to list the first three authors in subsequent citations: (Maxwell, Scourfield, Featherstone, et al., 2012) and (Maxwell, Scourfield, Holland, et al., 2012). To sum all of this up: if you can’t tell which reference a citation is pointing to, add more information to the citation until you can. 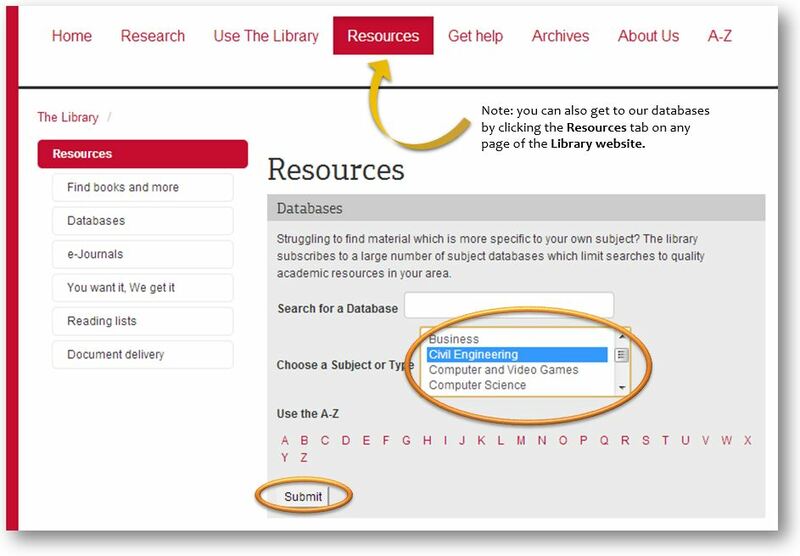 To find the best databases for your subject area, start at Library Search. Scroll down the menu to find your subject area. When you have selected your subject click the Submit button. 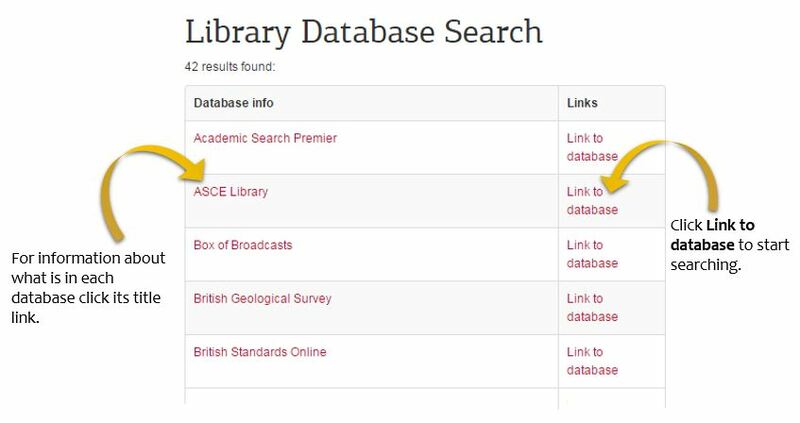 As well as journal articles, our databases provide access to all sorts of other information: e-books, conference papers, standards, theses, broadcasts and more. Have a look and see what is available for you to use.